I had planned to go to the mall in the afternoon in a sunny Monday morning to catch a movie. The movie started at 10, but I always try to get there early so the line for tickets isn't too long. When I pulled into the parking lot I noticed there were a lot of big movie production trucks and equipment being pulled back and forth into the first floor. Being from LA, this isn't a strange scene at all. Nothing could have prepared me for who I saw when I walked inside. I asked around to a few crew members what they were filming and they responded, "Savages." I had not heard of this film but I decided to take a closer look. Only extras and a few people who opened up the stores in the mall were watching since it was so early. And then I see none other than one of my favorite actresses from Gossip Girl, Blake Lively, donning shopping bags and filming a scene in the middle of my mall! I fangirled internally and waited about half an hour for her to take a break. Since the crew films Gossip Girl in New York, it is so hard to meet any of them, and I knew this might be my only chance. 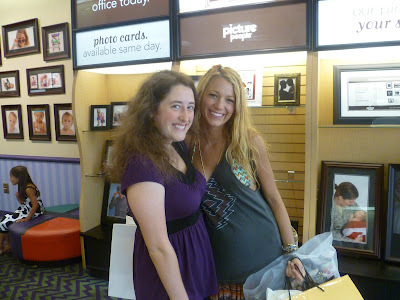 I bravely went up to her, introduced myself, and asked for a picture. "Sure, of course. Follow me," she said as she led me into a side store so it wouldn't cause a commotion and people wouldn't notice her. She was studying lines so after our picture I didn't want to hold her up, but I thanked her, and walked outside to continue watching her film. Needless to say, I did not catch the movie I had planned to that day, but what I saw and experienced instead was indescribable."